After living 2 weeks with all of our personal belongings packed in our van, the time arrived for us to pick up the bus. The owner got scheduled for jury duty on the day that we had planned, so we decided to drive through the night to arrive a day early. The GPS indicated that it would take about 9 hours. The drive started with fog and rain. We got a bit of sunshine before it changed to snow and ice. With just a few stops and a 4:00 AM break(fast) at Huddle House, we pulled in around 9 AM. We were totally excited about the bus, but also very nervous. Michael had only driven it a couple of miles when test driving it last summer. Now, he would be driving it 6 hours to Effingham, on little sleep, in Missouri hills, below freezing temperatures, with ice and snow. We said a few extra prayers and had St. Christopher working overtime on the drive and headed to Effingham, or home base. We had about 3 days to unpack the van, get insurance and registration in order, and find a home for everything in the bus. 2 - it will make things easier for our hosts since we will not require electricity. Also our water tanks are double the size of the Airstream, allowing us to go longer stretches between fills and dumps. 3 - it will allow room for our family to grow, replacing our 5 child size bunks with 6 full length bunks and an separate room for Michael and I. Although we have learned a lot about RV camping with the Airstream, we will be learning about a whole new set of systems this year. You'll see us in the trucker's lane at the gas station, filling up the 144 gallon diesel tank. We'll adjust our habits as we switch from relying on propane, to running all appliances off a giant diesel generator. No more opening the windows and turning on the vents to let in fresh air. We'll be counting on the 4 rooftop air conditioners and heaters to keep us comfortable. We left behind our cast iron and brought along an electric skillet. Our homemade pizzas will be on hold as we learn to cook with a microwave instead of an oven. 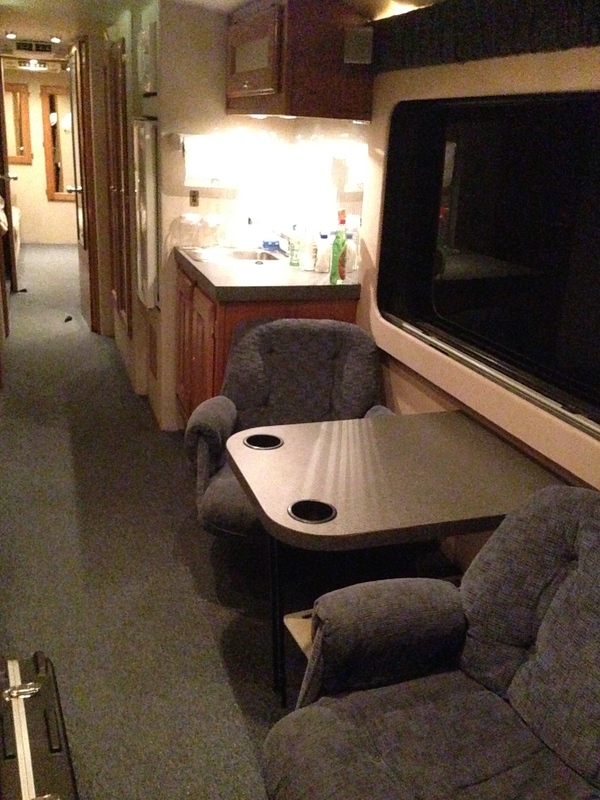 The appeal of this bus is that it is "move-in" ready, with enough beds for us all of us and a working bathroom and kitchenette. We find ourselves resisting the urge to modify it. The crisp white metal walls and vinyl furniture has been replace with cozy cream wallpaper and blue carpet. I am sure that the next few months will be learning the quirks and upgrades that may be needed in this 30 year old vehicle. Until then, I'm going to stretch out a bit and enjoy the quite of a bedroom with an actual closing door!